During Mike’s 50th birthday trip (Venice to Rome on land/back to Venice around Italy by ship), his college roommate Yost (whose 50th we were also celebrating) mentioned he was going to work until he was fifty-nine and a half and not a minute longer. What a great idea I thought – I’ve been putting money in my 401k since I went to work for Heery in 1983 (and my boss Edney refused to sign my timesheet until I had signed up) and since we sold the house in Key West, Mike and I have been trying to sock away every penny we can….ok, maybe not every penny or otherwise this blog about cruising wouldn’t exist! LOL It seems to me it is time to start spending it before I am too old to be able to really enjoy it. Since so many folks keep saying I am too young to retire (even though I disagree with them and think I was old enough 10 years ago….unfortunately the bank account didn’t agree) we will just call it not working anymore . Since Yost got me thinking, it has been my intention to stop work sometime soon after I turn fifty-nine and half (11/2/17). 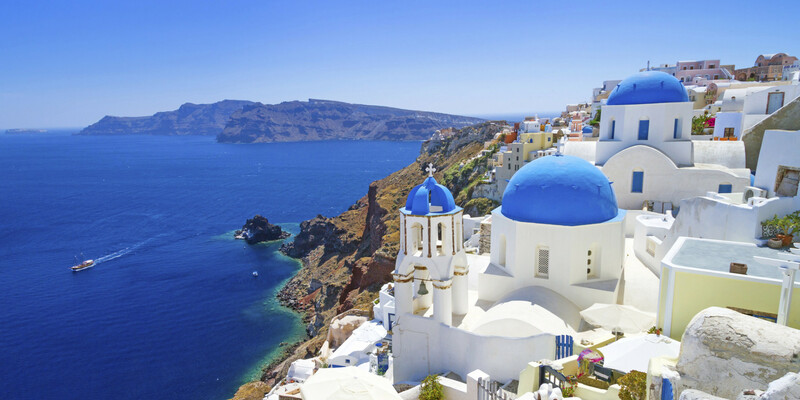 This happens to support my oft-stated wish to spend my sixtieth birthday Santorini Greece which I think is the most beautiful place in the world…if you disagree, that’s ok, I know I am right on this….I mean look at that picture at the top!) More specifically, I want to spend my 60th in “that pool” I saw the hotel while having lunch in Santorini during my 50th birthday cruise…there may have been a glass of wine or two served with lunch! No date for the work stoppage has yet been set (but it is likely to be shortly after the new year), but we have booked our transatlantic cruise which leaves San Juan on March 4, 2018 arriving in Barcelona 14 days later. More on the decision making process on the transatlantic in a later post..but suffice it to say we broke the first rule of retirement not working and exceeded our budget, but hopefully it will all work out ok in the end. We have also booked three nights at the Oia Mare Suites so I can be swimming in “that pool” on May 2nd. Our current plan is to spend about a month in Spain (probably half in Barcelona and half in Valencia), then two weeks in Santorini and then a month in Portugal (likely half in Lisbon and half in Porto). Because of visa requirements we have to leave the EU by June 10th so we are still discussing whether we are coming on back then or heading to Ireland, Scotland and England and then after being out of the EU for 90 days, return to whichever of the locales we have visited along with Italy are most likely to be under serious consideration for our future retirement not working anymore home. We then will take another transatlantic cruise back to the states in time for the holidays with family and friends. So come on along for what is sure to be an interesting (albeit long winded) description of the planning for this retirement not working anymore trip and then for the trip itself. And of course, if anyone is interested in meeting up with us somewhere along the way (the Oia Mare Suites has 22 rooms and there is plenty of room in “that pool” (hint, hint) please let us know…..it would be great to catch up with some of you face to face!